As the cuts continue to bite, the various agencies that work with vulnerable children have become more and more stretched. Multi-agency working has become ever more difficult to achieve. Fortunately there is a standard letter, which I’ve seen increasingly in use by these agencies. Feel free to copy this letter and use it in correspondence between social services, CAMHS, GPs, schools, Youth Offending Services and voluntary agencies. Lots of other professionals already do. This morning I read an article which I mostly agreed with, but contained a brief snippet that irritated me. Sean Duggan in the Guardian rightly points out that mental health services are suffering from a crisis of under-investment. It’s all very well for politicians to talk about “parity of esteem” for mental health with physical health, but that simply isn’t translating into services on the ground. Services are being slashed to the bone, with vulnerable people being left to sink or swim, and sadly, too many them sink and drown. Duggan is entirely correct to say that this needs to be reversed. Here’s the bit that irritated me. Just what do I do all day in CAMHS? Last year there was a picture meme going around on the theme of What people think I do/What I actually do. After I made some sarcastic remarks about the meme on Facebook, I was challenged to come up with one for my own role as a nurse therapist in Child and Adolescent Mental Health Services (CAMHS). Being one never to ignore a thrown-down gauntlet, I went on a trawl through Google Images, and promptly knocked together the following illustration. 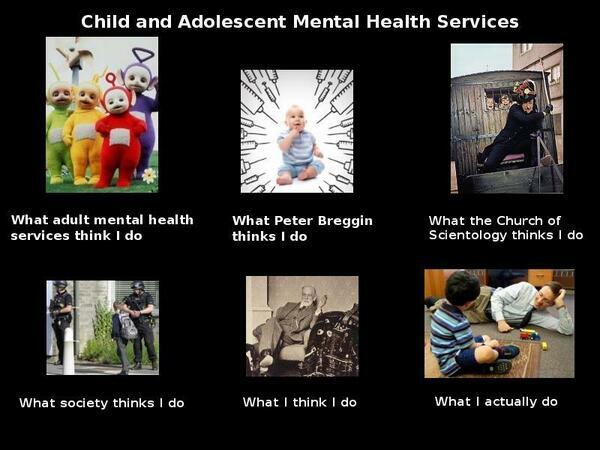 What adult mental health services think I do. Okay, it’s probably an exaggeration to suggest they think I work with Teletubbies. Even so, there is something of a disconnect between adult services and CAMHS. Our core client groups are palpably different, and so too are our ways of working. We don’t work a lot with people who have psychosis. Despite the American fad for diagnosing “pediatric bipolar disorder” (which even the Americans have been backtracking on in the last couple of years), conditions such as schizophrenia and bipolar disorder are rare in children. I see maybe one psychotic young person a year, usually in their mid-to-late teens. I do work with young people who hear voices, but it tends to be at the level of pseudohallucinations rather than outright hallucinations. One unfortunate consequence of this is that on those odd occasions when a psychotic child comes to a CAMHS team, they may not be as geared up to supporting them as an adult service. Conversely, adult services often aren’t as geared up towards treatment of eating disorders as CAMHS. Another difference is that people with depression and anxiety are more likely to be seen in primary care during adulthood, and in secondary care during childhood and adolescence. These difference tend to result in all kinds of problems when a young person turns 18. They often discover that they’re either transitioning to a very different kind of service, or they simply aren’t being offered a service at all. What Peter Breggin thinks I do. It is true that use of psychiatric medication has risen in the UK in recent years, and I’d be lying if I said I’m entirely comfortable with all aspects of that. Despite this increase, it’s still fair to say that CAMHS are much more cautious in their use of medication than either their American counterparts or their colleagues in adult services. I could count on one hand the number of medications I’m likely to come across in any given working day. If a young person is prescribed an antidepressant, 9 times out of 10 it’s likely to be fluoxetine, not least because it’s the only one licenced for under-18s. For ADHD there’s some relatively new drugs on the market, such as lisdexamfetamine aka Elvanse, but they’re not being prescribed much. The great bulk of young people with ADHD are still prescribed good old-fashioned methylphenidate (you know it as Ritalin, but it’s far more likely to be issued in various slow-release preparations such as Concerta XL, Medikinet XL or Equasym XL) with a smaller number taking atomoxetine aka Strattera. For sleep problems there’s melatonin. For highly agitated children there’s some use of low-dose antipsychotics (this has usually been risperidone, though there’s increasing use of aripiprazole instead) – and it’s this use of antipsychotics that I tend to feel uncomfortable about, even at low doses. Outside of the higher-tier services dealing with deeply-unwell young people, that’s pretty much all the medication you’ll see. Despite the controversies about dubious use of psychiatric medications in childhood (by no means all of which are unjustified) a high proportion of the kids I work with are on no medication at all. It’s also worth pointing out that I’ve worked with quite a few kids whose lives have been significantly improved through some judicious, well-monitored use of fluoxetine or methylphenidate. What the Church of Scientology thinks I do. All I have to say to this one is…If their argument is that psychiatry is superstition masquerading as therapy, and it’s all just a big scam to control people and take their money….Well, that’s a bit rich coming from the Church of Scientology. What society thinks I do. There seems to be an idea out there that all of society’s problems – unruly classrooms, chaotic family lifestyles, juvenile delinqency, crime – can be therapied away with six sessions of anger management. I can see why it would be an attractive idea to politicians, civil servants, parents, teachers, GPs, social workers – but it ain’t true. The psychiatric profession hasn’t helped itself in this regard by coming up with silly non-illnesses such as “oppositional defiant disorder”, but I don’t think mental health services should be there to get children to behave themselves, and I don’t think we generally do a good job when we try. If anything we can make the problem worse by trying to distil a wider systemic or social difficulty into a “condition” that the child has “got”. Hence why many CAMHS teams simply don’t accept referrals for ODD or conduct disorder. What I think I do. It would be fair to say I’ve put in quite a lot of training and studying into what I think I do. I’ve attended training on cognitive-behaviour therapy, as well as enhanced CBT for eating disorders. I’m currently paying out of my own pocket for some postgraduate study in systemic and family therapy. Over the years I’ve ploughed through a reading list of the great and the good. John Bowlby. Carl Rogers. RD Laing. Carl Jung. Paul Watzlawick. What do I do? Listen. Talk. Try to be a listener, an ally, a facilitator of reflection and problem-solving. Someone who works to build a relationship with young people and their families, and at times to help them build their relationship with each other. When one puts it like that, perhaps what I do isn’t that complicated after all. One of the joys of working in child and adolescent mental health services (CAMHS) is that I regularly get asked whether I think ADHD exists. It’s a topic that has two polarised camps. In one camp you get those who think it’s an attempt to medicate away all kinds of family and social problems, giving bad parents a handy excuse while lining the wallets of Big Pharma. In the other camp you have those who insist that those voices are simply pillshaming a debilitating but treatable condition. To start off, what do we mean when we say that a child (or adult, since adult diagnoses are on the increase) has “got ADHD”? 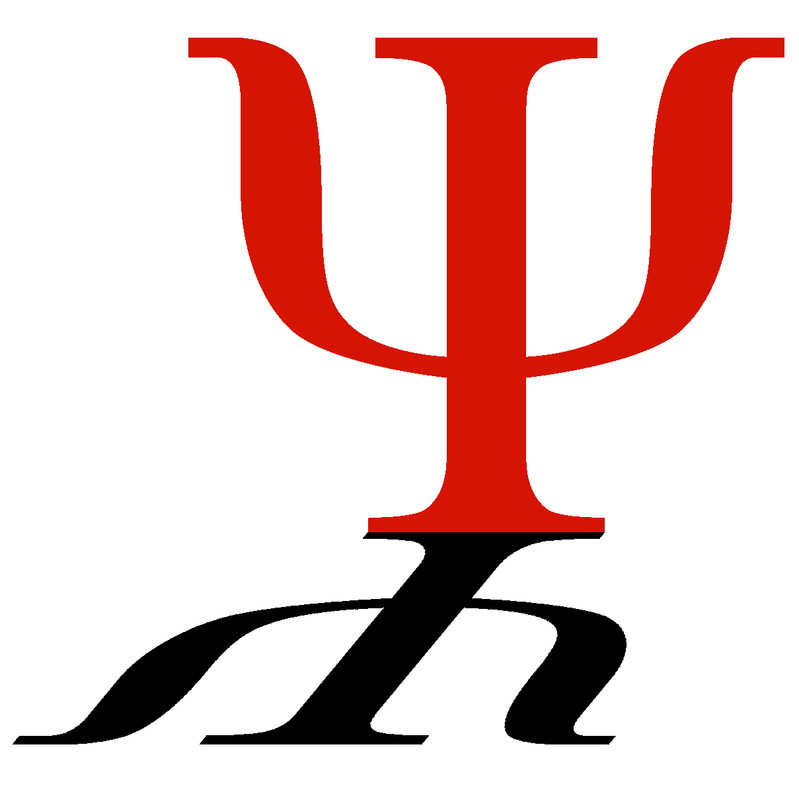 Well, the first thing to remember is that ADHD, as with most psychiatric diagnoses, is a descriptive statement about a collection of thoughts, feelings and behaviours that somebody happens to be displaying. There’s not a blood test or a scan for ADHD (or depression, or psychosis, or post-traumatic stress disorder etc etc). At the risk of simplifying somewhat, ADHD is defined by three core symptoms: inattention, hyperactivity and impulsivity. If you’re inattentive, hyperactive and impulsive, you’ve “got ADHD.” If you don’t have those three things, you “haven’t got ADHD”. What that doesn’t tell you is why somebody is inattentive, hyperactive and impulsive. Back in 2010 there was a big media hoo-hah after a Lancet paper was widely reported as having found a “gene for ADHD.” The media’s eye was particularly caught by a line in the abstract. Our findings provide genetic evidence of an increased rate of large CNVs in individuals with ADHD and suggest that ADHD is not purely a social construct. I don’t pretend to be an expert on genetics, but there’s a handy deconstruction of the paper by Neuroskeptic here. The upshot of it is that this particular piece of genetic evidence is likely only to account for 7% of individuals with ADHD. Fine, but what about the other 93%? I guess some researchers would be keen to say “other genes”. But if ADHD is essentially a description of symptoms, why do we need to think either all or none of it is down to genetics? We don’t assume that say, anxiety is caused by one single thing, be it biological or environmental. I see a lot of anxious children due to psychosocial events. I also worked a while back with an anxious child who turned out to have abnormal hormone levels. When the hormones corrected themselves, the anxiety disappeared. I’m not an ADHD nurse specialist – I’m something of a CAMHS jack-of-all-trades – but I run a regular nurse-led ADHD clinic. In that there are children who, for no apparent reason, seem to have been hyperactive, inattentive and impulsive from birth, and for those children a genetic component to their behaviour certainly seems plausible. There are also children who developed those symptoms after a head injury. And yes, there are children who have a strong history of being subjected to various psychological, family and social stresses. A while back I was running one of my ADHD clinics. For confidentiality reasons I won’t go into the details of the cases. However, what I will say is that after reading the notes I discovered that every child booked into my clinic that morning had either been sexually abused or exposed to domestic violence during early infancy. A lot of people outside psychiatry and psychology tend to assume that this would be unlikely to affect the child later on, because they wouldn’t remember those very early experiences. It’s true that these children probably don’t consciously remember what happened to them. However, at that very early age their fight-or-flight responses would have been going off like the clappers, right at the time when they would be starting to form those early attachment bonds that go on to develop the basis of somebody’s personality. What would a child be like if they developed an attachment style based on an aroused attunement to perceived danger? Jumpy? Fidgety? Finding it hard to sit still and focus on a schoolbook? What childhood condition does that sound like, eh? But here’s the thing. At every one of those appointments that morning, both the child and the parents agreed that he or she was benefiting from the medication. I don’t mean in a simple, “He’s behaving himself and not causing trouble” kind of way. As in they were coping better with the school day, able to progress in their education, able to make and sustain friendships. They were able to get on with being a child. This isn’t entirely surprising when you think about the medication involved. There’s various ADHD medications on sale: atomoxetine (aka Strattera), lisdexamfetamine (aka Elvanse) but by far the most commonly-used is methylphenidate. You all know it by its more famous name Ritalin, but that’s a brand name one doesn’t often see these days. It’s more likely to be prescribed in various slow-release preparations – Equasym, Concerta, Medikinet – or as generic methylphenidate. Methylphenidate is basically a performance-enhancing drug. One child psychiatrist (not one I work with) told me that when parents tell him that their child’s school grades have gone up since starting methylphenidate, he thinks back to his time at university, when he took speed to help with his exam revision. Methylphenidate is a stimulant that helps people to concentrate and stay on task, and can provide symptom relief to those who have trouble with that, regardless of why they have trouble with it. Throughout human history, people have used pharmacological products to improve their functioning on a personal, social or cultural level. Anyone who says otherwise simply doesn’t own enough Beatles albums. Little Johnny might be taking methylphenidate. His Mum is being prescribed fluoxetine to help her cope with the drudgery of her life. Dad is medicating himself from the stress of work with some diluted liquid ethanol from his local pharmaceutical supplier at Thresher’s. Meanwhile, Johnny’s teenage sister deals with her anger at Dad by smoking some herbal tetrahydrocannabinol that she obtains from an amateur, unlicensed pharmacist. Along the way she discovers it has some interesting effects on her art A level coursework. As the song goes, it’s a chemical world. If that sounds like a cynical way to put it, I should point out that methylphenidate is, unlike some of those other products mentioned, relatively safe. Not completely safe, but then no medication is. Even so, as long as there’s regular monitoring of fairly basic things such as height, weight, pulse and blood pressure the risks are low and manageable. Often those risks are much lower than simply allowing a child’s educational, emotional and social development to carry on being disrupted by whatever is causing them to become inattentive, hyperactive and impulsive. So, to go back to the question, “Does ADHD exist?” If by that do we mean that children can become hyperactive, inattentive and impulsive and that this can be corrected with medication, then yes, it does exist. If by that do we mean it’s a single condition with one single cause that affects every child who has it, I’d say not. To paraphrase President Clinton, I suppose it depends on what we mean by “exists”. Of course, this is not how the speakers would put it at a drug company-sponsored ADHD conference. Clearly the Sun must have either a short memory or a lot of gumption. Today they’re trumpeting the headline that Jeremy Forrest wants to wed the teenage girl he abducted, and the girl’s father would be happy to walk her down the aisle. Yesterday they reported that other teenage girls, some as young as 13, had received advances from him. The story focuses particularly on one girl who describes what sounds like some fairly classic grooming behaviour, while another was touched inappropriately and a third was receiving texts and online messages from him. Really, Sun? From sexual predator to star-crossed love story in the space of 24 hours? Don’t you read your own newspaper? I’ve read a lot of comments on social media trying to depict the Forrest case as some sort of modern-day Romeo and Juliet, in which the authorities have simply over-reacted. The trouble is, such suggestions are immediately scotched simply by reading the judge’s remarks prior to sentencing. There are almost no mitigating factors and a whole slew of aggravating ones. Just to prove what absolute rot is being spoken out there, I’ve juxtaposed some excerpts from the sentencing remarks with a selection of quotes that I found through a quick trawl on Twitter. The sentencing remarks are in bold. The tweets are in italics. …it makes such a difference how the story is told. Feminist judges will take different facts from the mass of detail to tell the story in a different way, to bring out the features which others discard, and to explain the features which others will find difficult to understand. …Feminist judges will set the story in a different context, a context which they understand but others may not. I am not going to presume to analyse Lady Hale’s self-ascription as a feminist. But I am going to open my observations on B (a Child), Re  UKSC 30 (12 June 2013) by observing that the only woman ever to sit as a judge of the Supreme Court yesterday sat in a lonely minority of one as she gave judgment for the parents while the four male judges gave judgment for the local authority. And to draw on her analysis above about how she might take a different approach, in a case involving the removal of a girl from her mother at birth. Touché. The point about co-operation was fundamental to this case, because there was broad agreement that the child could only be removed if it was necessary, and that meant that alternatives would not work; and the reason that alternatives would not work was held to be that lack of cooperation. Now, this point about co-operative social work is something of a hobby horse of mine. It seems to me fundamental to social work as a profession, and to the guidance under which we operate, that we try co-operation first, and compulsion as a remedy of last resort. I ask, “why don’t you try to seek consent”, and am told, “because we might not get it, and we’d have to act anyway”; and I ask, “but aren’t you more likely to get co-operation, and likely to get more co-operation, if you ask for it than if you don’t?” There are plenty of examples of the harm to a supportive relationship that can result from the premature use of compulsion. And yet even though it is a hobby horse of mine, the fact that the “parents had been able to co-operate with a succession of workers who were supervising their contact with Amelia over the whole of her life” but had a particular problem with the local authority that had made pre-emptive use of compulsion had passed me by until Lady Hale drew out the detail. More detail then: the mother was ‘over-anxious’ about the child who had been removed at birth, but not the child who had not. On my quick review of the majority judgments, I counted 17 specific endorsements of the minority analysis (including paragraph 73 “As Lady Hale (who knows more about this than anybody) says…”), and two specific disagreements (on the approach to proportionality by an appellate court, and the feasibility of remission). There were also statements difficult to categorise as one or the other: “[my analysis] appears to differ… However” (para 95); “real sympathy with” (para 99); “in deference to Lady Hale’s conclusions, I see how it could be argued…” (para 101). The earlier judgments adopted the factual matrix from Lady Hale (e.g. para 51); the legislation (para 50); and her approach to naming (para 2, 3, 132). One of the judges specifically endorses both the majority and the minority approach to significant harm (para 56). He also goes out of his way to specifically endorse Lady Hale’s guidance to practitioners (para 56). The truth of the matter is that it is the minority judgment that is truly useful. I commend it not only for its emotional intelligence (and because I agree with almost all of it! ), but because of its lucidity, clarity of reasoning and its attempt to give real guidance to practitioners. Which leaves wide open the question, “but is it the law if she’s in a minority”. A question which is difficult to answer but cannot be a resounding ‘no’ and may well be a qualified ‘yes’, given the nature and extent of endorsement from the majority. Allan Norman (@CelticKnotTweet) is a registered social worker and a solicitor at Celtic Knot – Solicitors and Social Workers. When is guidance ‘statutory’ and does it matter? Local authorities shall, in the exercise of their social services functions, including the exercise of any discretion conferred by any relevant enactment, act under the general guidance of the Secretary of State. Parliament by section 7(1) has required local authorities to follow the path charted by the Secretary of State’s guidance, with liberty to deviate from it where the local authority judges on admissible grounds that there is good reason to do so, but without freedom to take a substantially different course. And there we have it: a peculiar kind of law emanating from the executive rather than the legislature. It is still guidance because, exceptionally and with good reason, we might deviate slightly from it; but it carries its own legal authority because, almost all the time, we must follow it. Over recent years, other Acts of Parliament have created similar powers for executive-driven binding guidance; the guidance has been held to be binding on a wider range of people; and a plethora of both major and minor documents have been stated to have the status of what is now generally termed ‘statutory guidance’. I think it is time to revisit the term ‘statutory guidance’. The label confirming the status ‘statutory guidance’ helped us for a while. I am not sure it does any more. I think we should be asking the question, is it ‘binding’ guidance instead. Here is why. What is the status of non-statutory guidance? All sorts of people throw guidance at professionals that does not bear the label ‘statutory’. It is of varying quality and usefulness. Some of it is driven by a political agenda, whether of politicians or campaigning groups. Much guidance emanates from employers – policy, practice and procedural documents. Such documents may not have the label ‘statutory’, but if they guide our path, improve our practice and keep us from legal error, they may have an important role nonetheless. Six months ago, the High Court in Ali v London Borough of Newham  EWHC 2970 (Admin) (30 October 2012) ruled on the status of a piece of non-statutory guidance. The Department for Transport has produced guidance on the use of tactile paving to assist the visually impaired. The national guidance was developed in conjunction with and with the endorsement of Guide Dogs for the Blind and the RNIB. The caselaw has arrived at a significant point in relation to non-statutory guidance: we may be bound by guidance because it is authoritative and expert, rather than because of its label. Can statutory guidance change our legal obligations? There are a number of threads to pick up, to work out the effect that statutory guidance has on our legal obligations as social workers. First, let’s not beat about the bush: by section 7 and similar sections, Parliament intended to delegate authority to the executive to create guidance that social workers should follow, irrespective of the wisdom of that guidance. There are plenty of examples of guidance which have enlarged the law. That is to say, by embellishing the bare bones of the legislation, they have created additional obligations upon us. The various Codes of Practice we must follow (Mental Health Act, Mental Capacity Act, Deprivation of Liberty Safeguards) are examples. It is one thing to suggest that guidance can enlarge the law, quite another to suggest that it can change it. Delegated guidance has to be consistent with the higher legal authorities from which it derives its own authority. That this includes human rights ought perhaps to be uncontroversial, but in fact two recent legal tussles have illuminated the interface of delegated guidance and human rights. First is the Home Secretary’s frustration with the approach taken by the courts to deporting foreign nationals in the light of Article 8. In one bout of this ongoing struggle, the Home Secretary amended the Immigration Rules, purporting to tell judges how to apply human rights. These Rules have in common with statutory guidance that they emanate from the executive, and are not legislation. They go further than statutory guidance in that they are “presented to Parliament” under the primary statute, rather than simply deriving their authority from it. Quite properly, the Upper Tribunal has held that while the new Rules can “operate to enhance judicial understanding of the ‘public interest’ side of the [proportionality] scales”, they cannot relieve courts or tribunals of their obligation under the Human Rights Act 1998 to apply Article 8 itself. that the Secretary of State acted in a way which was incompatible with Article 8 of the Convention in failing to revise Code C so as to distinguish between the treatment of an adult detainee and a detainee under the age of 18. Article 8, read with UNCRC, requires a 17 year-old in detention to be treated in conformity with the principle that his best interests were a primary consideration. Statutory guidance, then, can usefully enlarge on the detail of our legal obligations, but cannot diminish our obligation to give precedence to human rights. We have arrived at a point where authoritative expert guidance from the Executive that will help us to apply the law correctly might not need the prop of a ‘statutory’ label to make it binding; whereas even the label ‘statutory’ gives us no certainty that guidance is actually compliant with the law so that it should be followed. That is the context in which, in an earlier blog, I boldly suggested practitioners might keep ‘Working Together 2010’ by their elbows. It had been modified over time to take account of developing learning; it set our lessons from research; it had whole chapters devoted to particular areas of practice difficulty; it incorporated lessons from the Laming reports; it attempted to set out how to comply with human rights principles; and it incorporated by reference a number of other specialist guidance documents. It was by no means perfect, but it was unquestionably useful. It served the purpose such guidance should serve, of drawing together in one place what we need to know to get it right. One of the criticisms proffered of its successor guidance concerns Appendix C. Here, over 3 pages, is a list of “Supplementary Guidance”. But it is just that – a list. It doesn’t set the context of the documents, as Chapter 6 of ‘Working Together 2010’ did. Strictly speaking, it doesn’t even tell you whether you should follow the supplementary guidance. It’s more like a reading list. This has led some to suggest or to fear that ‘Working Together 2013’ has downgraded the status of some of the specialist guidance that used to be incorporated, or incorporated by reference, in the older version. ECPAT, for example, has criticised the omission of the detailed guidance on trafficked children. That is only the tip of the iceberg of specialist materials that have been omitted in service of the goal of a shorter, pithier ‘Working Together’. But I venture to suggest all is not lost. In this brave new world where we must look beyond the label, and check for ourselves whether guidance does what it says on the tin, the absence of authoritative detail may diminish ‘Working Together 2013’. But the documents mentioned in its Appendix C may be enhanced rather than diminished by standing alone. Losing control of the rudder?